When it comes to custom buildings, Greiner Buildings is your number one expert. We have been constructing pole barns, hoop barns, steel buildings, and post frame buildings in the Midwest for the past 25 years. Our team is widely recognized for our elite customer service and professionally designed buildings. With us, the sky is the limit! We have created thousands of custom designs for every type of building. No matter what your building needs are, we can make them happen for you. 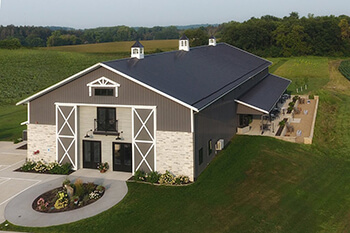 Greiner Buildings has earned several awards in agricultural workshops, residential building competitions, and more. We are proud of our modern and unique buildings that always impress. Check out our testimonials to see what our previous customers have to say! If you are looking for a building that is not listed above, just let us know! We would be happy to work with you and provide you with a free estimate. When working with us, you will find our team dedicated to your project. From the initial planning of the project, through the construction process, and to handing you they keys, we are with you every step of the way. Our goal is to give you a custom building that you love, and that is uniquely designed for your needs. Not only are we experts in new construction, but we also offer a variety of other services including building repair, general contracting and project management. If you have an old barn or other building that needs restoration, we can repair it for you so that you don’t have to tear it down and rebuild. If you are a contractor in Boone, Iowa, we have professional resources for you when it comes to project management. Take a look here to learn more. Let Greiner Buildings be your number one choice for building services in Boone, IA and surrounding areas. Give us a call today to get started with your free quote!